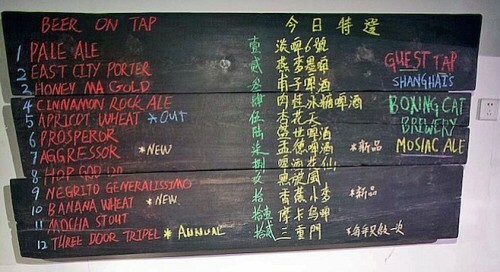 May 20 kicked off the fifth annual Shanghai Beer Week. Beer is huge in the world's most populous nation, and craft beer is growing — Shanghai's Boxing Cat Brewery even won a silver medal at last month's World Beer Cup. According to reports by the USDA Foreign Agricultural Service, China has been both the world's largest beer producer and consumer for more than 12 years. However, in 2014, domestic production declined for the first time in a decade, just as the craft beer market has started to grow. A February 2015 report declared, "U.S. Craft Beer Has a Great Potential in the China Market," estimating the market will increase in value to between 5 and 12 million dollars by 2017. A follow-up report released in December specified "a wave of consumers’ craze for IPA craft beer in China." It credits the rise in IPA demand to a well publicized news story. During a state visit last October, UK Prime Minister David Cameron brought China president Xi Jinping to a British pub and bought him an IPA. "Thanks to this news," the report reads, "many Chinese researched online about IPA and eventually learned that the U.S. is home to many good IPA beers." Craft-beer distributor Quality in Brews cold ships American craft beer into China and several other Asian nations. Cofounder Matthew Abeyta lived in China for ten years before starting the company, and he says Chinese beer consumers definitely consult the web — specifically apps such as RateBeer, BeerAdvocate, and Untapped — to decide what to buy. He adds, "It has to be a top-tier brand." At least, top tier of what's available. According to Abeyta, the number of craft labels shipping to China is still just rising. "Goose Island is launched," he says, "Firestone Walker launched two months ago." Each of those brands benefitted from existing distribution paths thanks to the ownership stakes of global beer companies AB InBev and Duvel, respectively. But with importers like Abeyta's springing up, smaller companies are finding ways into the potentially lucrative market. "We're launching Belching Beaver the end of next month," he adds. As to what will help future sales as the China market catches on, the USDA report suggests, "With a great market potential, U.S. craft-beer industry needs a more aggressive market promotional plan to establish a positive brand image and convey product knowhow." Abeyta adds, "Things like packaging are super important. We can't put a product on a shelf and expect it to sell if it isn't eye-catching."